This 2 Person BASICS Disaster Kit comes in a high quality bag and is designed to sustain two persons for 3 days (72 hours) in the event of a disaster or emergency. 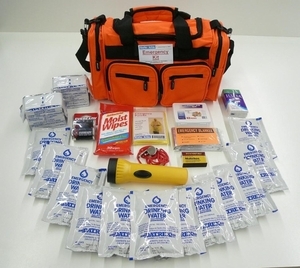 Get prepared for any disaster or emergency with this easily visible 72 hour rated emergency kit. Keep this kit at home in the car, at the office or workplace, take it with you when hiking, camping or venturing outdoors. Highest quality survival supplies make this disaster kit ideal to be prepared.